Open plan with King size bed, en-suite bathroom (shower & bath) or shower and spa-bath, fully equiped kitchenette( bar fridge, microwave etc.) television, telephone, Wi-Fi hotspot and airconditioning. These units contain a King size bed (or twin beds), kitchenette(bar fridge, microwave oven etc. ), en-suite bathroom (bath & Shower) or shower only, telephone, TV, Wi-Fi hotspot & balcony. 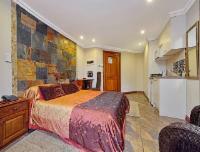 King size bed (or twin beds) plus 1 single bed extra, kitchenette(bar fridge, microwave oven etc. ), en-suite bathroom (Shower ONLY), telephone, TV, Wi-Fi hotspot & balcony. Double bed , kitchenette (bar fridge, microwave oven etc. ), en-suite bathroom (Shower) , telephone, TV, Wi-Fi hotspot & balcony. If cancelling 7 days before arrival, forfeit 100% of the booking total. If cancelling 14 days before arrival, forfeit 100% of the deposit. If cancelling 21 days before arrival, forfeit 75% of the deposit. If cancelling 28 days before arrival, forfeit 50% of the deposit.